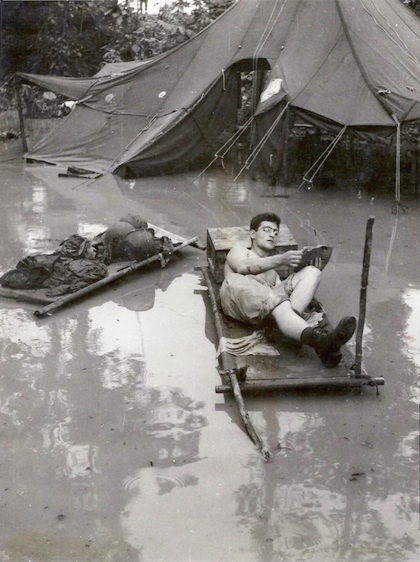 Picture this; you’re a combat soldier in WWII a few thousand miles away from home, hunched down in a murky bunker waiting for your orders to leap out onto the frontline of Normandy. Moreover, you’re the co-pilot flying a United States aircraft loaded with an atomic bomb en route to the Japanese city of Hiroshima… or further still, you’re one of the sixty-eight American servicewomen captured as a POW in the Philippines. Working closely with publishers, librarians, and booksellers, the Council on Books in Wartime agreed to organize and manage the project. Their task was to marshal the whole American book industry in favor of the project, and they succeeded. Set up as a non-profit organization, it did charge recuperation costs to cover the cost of printing and distribution. The Council drew up a set of recommendations that all participating publishers and authors abided by, making it fair game for all involved. Each month thirty to forty books would be selected by an advisory committee and reprinted as ASE editions. The books would be distributed free to Armed Services personnel with a wide selection of current publications and books of widespread popular appeal. In September 1943 the very first ASE to be printed was Leo Rosten’s collection of short stories – The Education of Hyman Kaplan. How Gibran’s The Prophet got on this list is a question pending further research from his publisher Alfred Knopf. I’m on the case. The exact publishing and readership numbers of Gibran’s Prophet of War are hard to know, yet I could only imagine that the brave soldiers who did read it got some comfort from the book during their service. 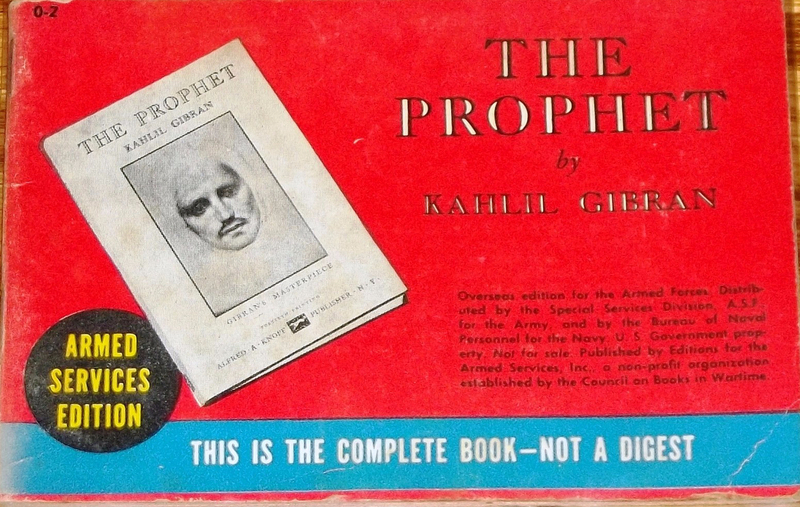 One can also conclude that whilst the selection of reading material was vast for such a small print run of four years, The Prophet was the only one included from an Arab-American. Although he did not live to see it circulate, I’d imagine he would have taken comfort in knowing that his book was read on the battlegrounds, the same battlegrounds that overthrew the oppressive Turkish rule in his beloved Lebanon, a subject close to his heart. Gibran fought long and hard with his brush and pen for years to liberate the Levant. In 1914 he published an “Open Letter to Islam” calling on the various native sects in Ottoman-occupied lands to cease their internecine struggles and unite in opposition to the Turks, as well as writing other articles highlighting the plight of his people and appealing for aid. He also helped organize a League of Liberation and was instrumental in the formation of a relief committee which raised funds to combat the famine that was sweeping the Middle East during those terrible years. So was it any wonder that his book ended up in the pockets of these brave soldiers? I can’t help but ask myself, what would Gibran have said about it? As a champion and campaigner for peace and unity – What would he have thought of his Prophet of War? I do have to end this piece with a …”To be continued” as I feel it is not the end of this story. In recent developments, I have acquired a copy of the book with soldiers names imprinted on the inside cover. My search continues.